UAF has received an award but spending is necessary prior to the official start date fo the project so expenses will fall outside the period of performance of an award. Spending is necessary prior to the internal set-up of an award but expenses will fall within the anticipated period of performance of an award. 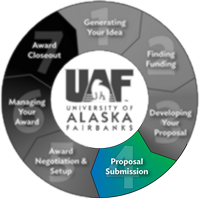 Award is already in place but UAF is waiting on receipt of an incremental funding award notice (e.g. additional year funding). A no-cost extension has been requested and OGCA is waiting on sponsor approval. Revised Budget: If a sponsor agency determines that it intends to fund a proposal but at an amount less than what was requested in the budget, the agency may request a revised budget. If a PI is asked by a grant agency to revise a proposed budget, the unit should prepare a revision using the standard process and naming conventions.